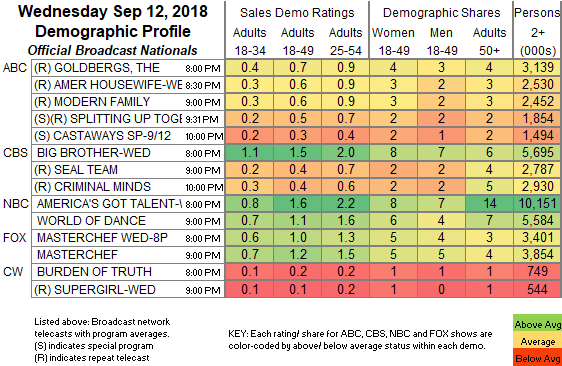 NETWORK FINALS: BIG BROTHER and AMERICA’S GOT TALENT gained 0.1 in final numbers, while CASTAWAYS and the reruns of SEAL TEAM, AMERICAN HOUSEWIFE and MODERN FAMILY dropped the same. CABLE HIGHLIGHTS: FX’s AMERICAN HORROR STORY: APOCALYPSE continued the show’s downward trend despite easily leading Wednesday cable at 1.45, considerably lower than the show’s 2.02 from 2017 and 2.78 from 2016. (Since AHS customarily has a tremendous Week 2 drop, by next week it may be neck-and-neck with the network’s new MAYANS MC.) VH1’s BLACK INK CREW gained 0.03 to 0.49. On HGTV, PROPERTY BROTHERS climbed 0.09 to 0.38, HOUSE HUNTERS grew 0.04 to 0.28, and HOUSE HUNTERS INTL was up 0.04 to 0.26. History’s FORGED IN FIRE returned at 0.38. MSNBC’s RACHEL MADDOW SHOW led cable news at 0.36/0.56/3.4M, with CNN’s CUOMO PRIME TIME at 0.33/0.48/1.7M, and Fox News’s HANNITY at 0.29/0.49/3.2M. OWN’s GREENLEAF jumped 0.14 to 0.34. TBS’s FULL FRONTAL returned from a week off at 0.33. 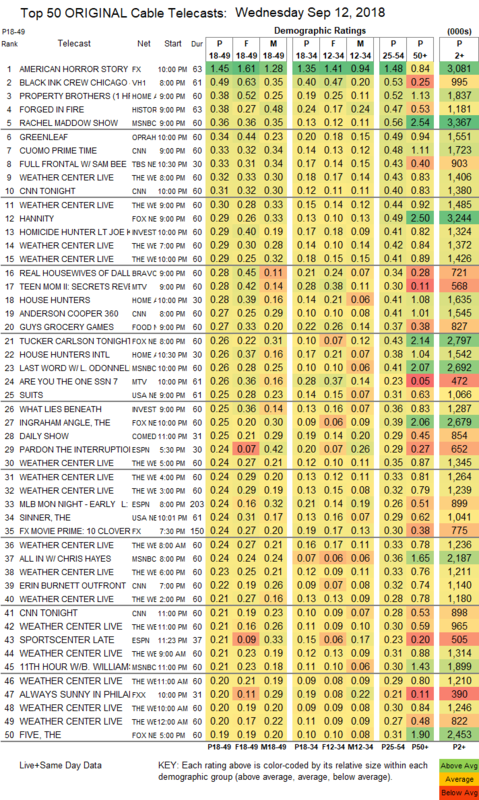 The oncoming hurricane put Weather Channel’s WEATHER CENTER LIVE in 4 of the Top 20 slots, led by the 8PM edition at 0.32. On ID, HOMICIDE HUNTER dropped 0.05 to 0.29, and WHAT LIES BENEATH was down 0.06 to 0.25. Bravo’s REAL HOUSEWIVES OF DALLAS rose 0.04 to 0.28, and REAL HOUSEWIVES OF NYC (a clip show?) was down 0.31 to 0.16. On MTV, TEEN MOM grew by 0.06 to 0.28, and ARE YOU THE ONE was down 0.03 to 0.26. On Food Network, GUY’S GROCERY GAMES ticked up to 0.27. On USA, SUITS shed 0.04 to 0.25, and THE SINNER was down 0.05 to 0.24. FXX’s IT’S ALWAYS SUNNY IN PHILADELPHIA plunged 0.18 from last week’s season premiere to 0.20. On A&E, a DEAF OUT LOUD special was at 0.11, and back-to-back RAISING TOURETTE’S episodes were at 0.11/0.11, compared to last week’s 0.12 hour. El Rey’s LUCHA UNDERGROUND ticked down to 0.02/79K.